It is a great honour to translate this list from Japanese to English, knowing that it might help victims' families to confirm the fate of their loved ones. Those who know the Japanese language would appreciate the difficulty of accurately translating foreign names (in phonetic Katakana) to English, as the Japanese scripts usually do not differentiate between R and L; C and K; B and V; and H and F. As the Japanese source document was a handwritten copy of another document, there were a number of possible transcription errors (like crossing 't' and dotting 'i' in written English). So, sometimes it is difficult to decide on the same base Katakana character, if it is 'fu', 'hu', 'bu' or 'pu' when the only difference is the presence or absence of two small dots or a small circle. The sound as written also depends very much on how it was pronounced, what the person recording the information actually heard, and how that person represented that sound in writing. In this document the text is mostly written without discernible breaks between surnames and given names, so a name like Charles Ross Field could also be Charles Rossfield. For the military portion of the list we used the English list of names, originally bound with the Japanese list, as a cross-reference. 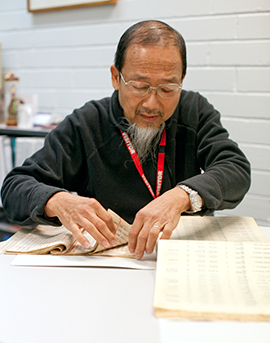 We also referred extensively to the typed 'Complete Rosters of Australian Prisoners of War' (A–K and L–Z), (as yet undescribed in the National Archives of Australia's collection) which was transferred from Japan at the same time. It was not always possible to confirm a likely match. The Rosters often show the surname typed as translated, then corrected by hand to the name that appears in the English list. Entry 377 HALE is one example: shown as HALE B R amended to POWELL Bartholomeus. This, and the absence of service numbers on the Japanese list suggests that the English list was compiled, at least partly, using the Rosters. For the civilian portion of the list, we referred to other records in the National Archives' collection which contain versions of the same information: DS16/2/1 PART 2, Civilians detained by the Japanese; A518, GR16/2/1, Defence – General – Information of deaths for persons lost on the MONTEVIDEO MARU; MP742/1, 255/15/1643, "Montevideo Maru" Nominal Roll Civilian Internees Lost at Sea as Result of Sinking; and A7030, 6, Persons lost on "Montevideo Maru". All references, including this Japanese list, state 208 civilians were on board the Montevideo Maru. However, this list and many of the other translations in the records, record 209 individuals. On the Japanese list the name listed at 141 in earlier versions is listed at 142, and that at 142 is listed at 141. While some of the names translated may seem far from related records in the National Archives' collection, we have translated as closely as possible the sound as written, and not assumed transcription errors which would produce another interpretation. In the original where there are ditto marks, we have put the full text in the translation. I agree with the suggestion of a member of Archives' staff that the 'surname' for the civilian entry number 82 may instead express a string of obscenities. Despite our best efforts, there are bound to be instances where we have not arrived at the correct spelling especially with the names of villages, districts, plantations, and companies that are no longer readily identifiable. The generous assistance of all National Archives' staff involved in this project, and in addition the very capable assistance of Merilyn Minell, has been much appreciated. Dr Ta-Yan Leong translating the Japanese list.